Anyway you slice it, American cheese has been having a hard time as of late. The melty, gooey squares wrapped perfectly in oily plastic sleeves -- the highlight of childhood grilled cheese sandwiches and backyard cookouts -- have been declining in sales for four years and counting, another supposed victim of millennial tastes. But before American cheese was hated, it was respected and well-loved. The processed cheese that has become known as American cheese was first developed in Switzerland, not America, back in 1911. Cheese alchemists Walter Gerber and Fritz Stettler heated up emmental -- a hard, Swiss cheese -- with sodium citrate in an attempt to create a cheese with a longer-standing shelf life. Not only did the addition of the sodium citrate achieve their goals, it also made for a smoother, velvet-like cheese. Stateside, Canadian-born James Lewis Kraft was experimenting with a similar process: heating and then cooling cheeses to form what was called a “warm cheese.” The “warm cheese” was easier to slice and made for convenient distribution. As Kraft’s business -- which purchased cheeses wholesale and sold them locally (using a horse named Paddy and a rented cart) -- grew, so did the desire to carry longer-lasting cheeses that could be shipped. Emulsifying salts were later added, which give American cheese its coveted melt as well as helped maintain its freshness. Additionally, a process to cool, slice, and package the singles was patented by Norman Kraft in 1944. American cheese served all the purposes it was intended for: It was convenient, lasted a long time, and tasted enough like cheese for Americans to overlook its processed nature. As Field confirmed, it was shipped overseas for the troops and made its way to bologna and cheese sandwiches all across America. In fact, the fact that it came prepackaged in a society that was wholly benefitting from an industrialized America was a positive; it was seen as a luxury to be able to purchase the “De Luxe” Kraft slices, which were touted as “perfect” -- in shape, flavor, and convenience -- in 1950s Kraft advertisements. Over time though, American cheese culture expanded. Once viewed as elitist and inaccessible, cheeses that were considered fancy have now become more attainable and approachable. Blue cheese is celebrated on burgers, goat cheese is folded into mashed potatoes, and brie, gouda, and gorgonzola all commonly find their way onto decorated cheese plates. Not only that, but Americans have grown to avoid processed foods and opt for whole, real ingredients that are easier to understand and trace. In a more health-conscious society, consumers want to know where their food is coming from -- and how their bodies will process it. The heyday of neon orange-powdered instant mac has been replaced with a white cheddar option (complete with organic pasta). There are talented cheesemakers all across America delivering interesting, new cheeses that are flavorful and transparent in their production. 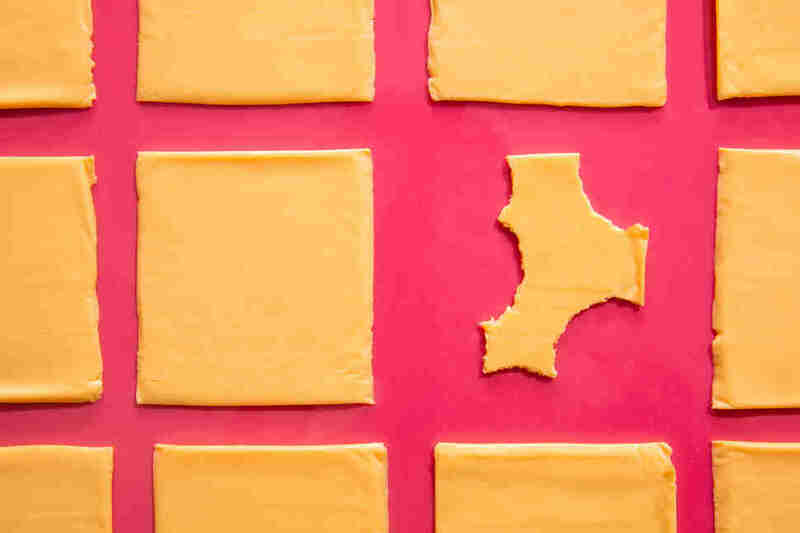 Instead of optioning for the once-desired American cheese, everyone now seems to have a negative opinion on the flimsy, bright orange squares. Well, not everyone. Many fast food chains -- purveyors of classic American cheese -- continue to stand by the cheese. Shake Shack sources its American cheese from Wisconsin. The beloved West coast chain, In-N-Out, also includes American cheese in its ingredients. Five Guys goes with the classic, layering their cheeseburgers with Kraft’s slices. “The Murrell Family tested a variety of cheeses before landing on American cheese. Ultimately, they felt American cheese tasted best on Five Guys’ hamburgers,” Lauren Lewis, the director of marketing at Five Guys, explained. “We ended up selecting Kraft because it is a well-known, reputable brand with a global reach.” That being said, Five Guys’ Kraft American cheese isn’t the same as the Kraft singles you can pick up at your local grocery store; it contains a higher percentage of cheddar cheese and butter, giving it that same craveable melt paired with the punch of saltiness from cheddar. People decry American cheese, stating that “it’s not even real cheese!” when in actuality, it does contain real cheese. Like milk, American cheese -- a combination of cheese, milk, and dairy ingredients -- goes through a pasteurization process. The salts are then added to “facilitate the even, consistent melt,” according to Field. People decry American cheese, stating that 'it's not even real cheese!" when in actuality, it does contain real cheese. 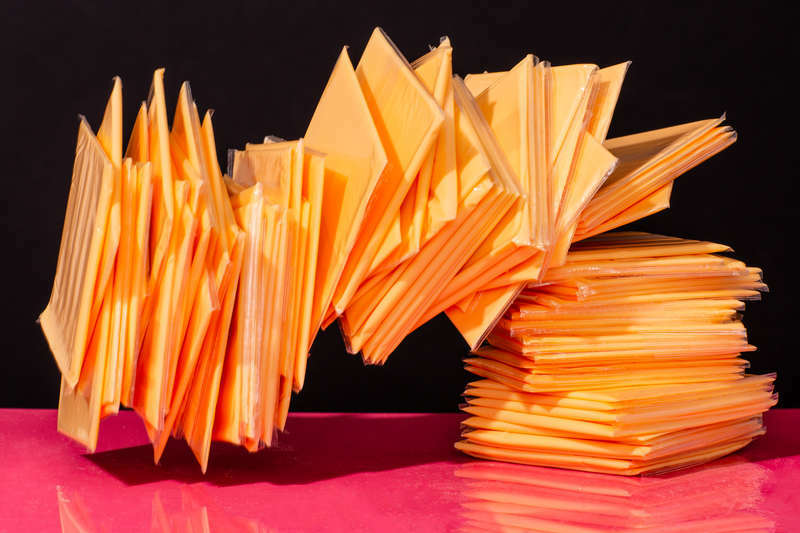 To get the best of both worlds, there are other cheese brands that are crafting American cheese slices while placing an emphasis on health and environmentalism. Horizon Organic’s American cheese slices, for example, are “produced with no antibiotics, no persistent pesticides, no added hormones and only non-GMO ingredients,” said Lee Nelson, Horizon Organic’s brand manager. Daiya Foods, based out of Canada, carries dairy-free slices of American cheese for vegans and those with lactose intolerance. Gabriel Martinez, the former chef of Brooklyn’s beloved Long Island Bar, knew that he had to include American cheese when conceiving the restaurant’s celebrated burger. “My gripe with just melting a slice of cheese on a burger is the inherent greasiness when it gets ‘over-melted,’ thus I have always opted for American slices as they are an emulsified product that stay super creamy when heated,” he explained. “Given my discerning palate and basic knowledge of modernist cooking, I set out to make my own with a better quality base product.” Martinez credits his inspiration to Wylie Defrusne’s beer cheese version, and settled on a blend of raclette and cheddar for his finished product. Since launching the L.I. Burger, a new chef -- Kevin Walker Garrett (who is also a proponent of American cheese) -- has taken over, and formulated a new sliced topping for Long Island Bar’s aged beef burger. “I think there’s a nostalgic quality to [American cheese]. I grew up a poor kid from Texas and I would make American cheese sandwiches. I would take tortillas that my mom would make and put American cheese in there. It’s comforting, it’s good,” he reminisced. Kat Thompson is a staff food writer at Thrillist and enthusiastic about putting American cheese -- the rightful cheese -- on cheeseburgers. Feel free to disagree with her via Twitter @katthompsonn.